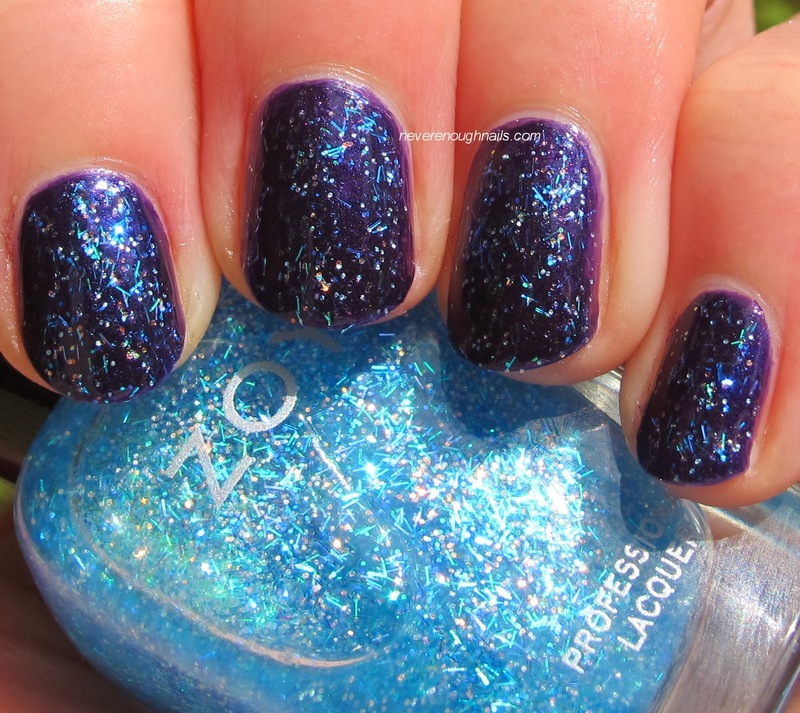 Never Enough Nails: Zoya Zenith Holiday 2013 Collection, Part 1! The Zoya Zenith collection has been pretty hotly anticipated in the few weeks since we first heard about it. I can't believe I'm already swatching a holiday collection, but such is the way of the beauty industry. The first polish I tried from this collection was Zoya Seraphina, a pale white gold/silver with an interesting metallic foil finish. It's not really a true foil, it's almost like a foil fleck (instead of glass fleck). The color is lighter and brighter than most silver polishes I own. Zoya calls it a "Polaris silver" and if they mean Polaris the brightest star in Ursa Minor, I can see that description- it's kind of like a bright star. It also reminds me of the color of glittering snow or ice. I used three thicker coats of Seraphina for these pictures. The first coat was very very sheer. If you tend to do thin coats, you may need four coats to hide any VNL. Aside from the sheerness, the formula was good, maybe a tad on the thin side. All swatches in this post are with one coat of Essie Good to Go on top. 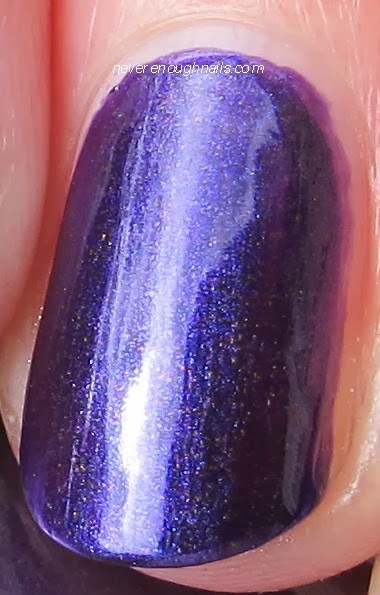 Zoya Belinda is a pretty blurple shimmer. Being the sucker for purples that I am, I like this a lot. It's not the most unique shade in the collection, but blurple shimmers are generally pretty popular with the nail community. This color is pretty seasonless, it doesn't scream "holiday! ", so you can get quite a lot of use out of it. I used two coats of Belinda for these swatches. The formula was good, but not excellent. It was a little thin and not as easy to control as I would have liked. You have to use a bit of caution to avoid pooling in the cuticles. Nice full coverage though. I decided to layer Zoya Mosheen over Belinda, because I thought it would be easy to see all of the glitters over the dark base. Mosheen is a mixture of iridescent ice blue glitters and bar glitters in a clear base. 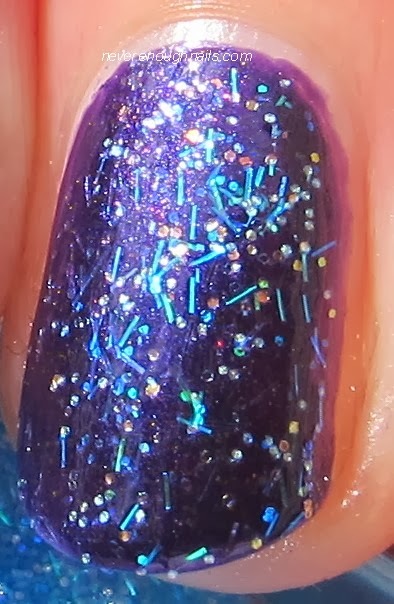 I am not a fan of bar glitter, so I can't say I love this. The bars are small though, so they mostly laid flat on the nail. The ice blue color of this is very cool and wintery though. I might want to try it over a bright white, or maybe even Seraphina, for a real winter storm look! This is two thin coats of Mosheen. It packs a fair bit of glitter in one coat, but I always like to have even more glitter. The glitters all come out easily on to the nail, no fishing required. I can't wait to try the other three from this collection (especially the scattered holos!!). Stay tuned for those swatches! Love the looks of Seraphina! Onto the wishlist it goes! Mosheen is surprisingly bleh to me. I really liked Seraphina too Rochelle! I agree about Mosheen, but I thought maybe it was just because of my dislike of bar glitter. Oh well, plenty of other pretties in the world!